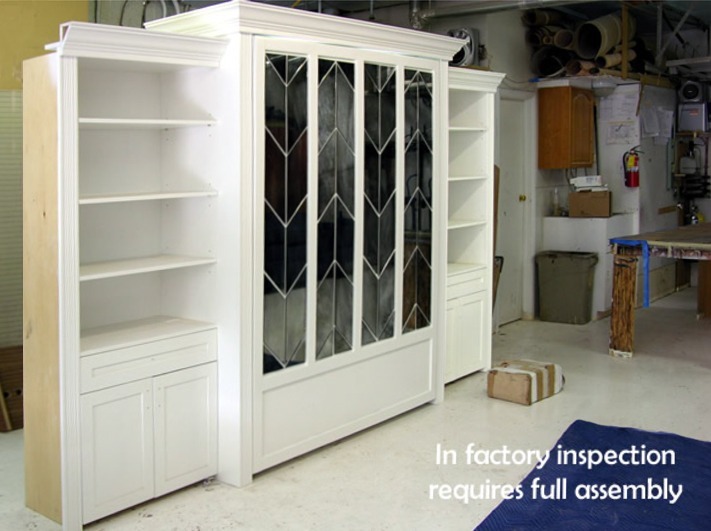 This King size Murphy bed with Mirror is 128″ in total width: Clothes rod and drawers are in pier cabinet on the left. Small desk on the right. King bed in the middle. Black lacquer in semi gloss finish and our stacked tier crown really set this Mirrored Murphy bed system apart. Worried about shipping? Don’t be! 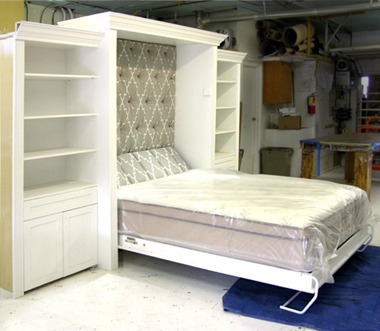 We individually wrap each section of our beds in foam and then place them inside custom-built plywood crates. Visit our How We Manufacture page to see a photo. We have never had a mirror break during shipping. Yes, it is a real 1/4″ thick clear glass mirror, weighing over 135 lbs. 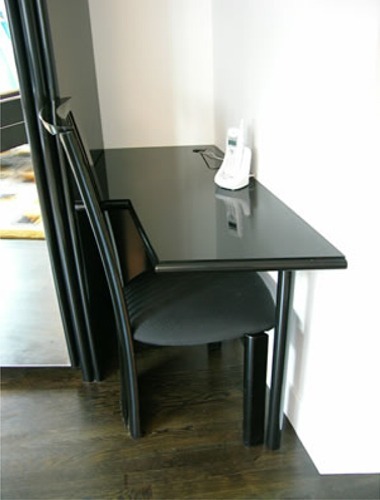 What makes this Murphy bed work is the SICO Room Maker Murphy bed Mechanism. It allows the weight of the King size mattress and giant mirror to be held at all positions as it is lifted or lowered, and it is operated effortlessly. Don’t believe me? Watch the video at the bottom of this page. No other Murphy Bed manufacturer can accomplish this. This unique Murphy bed with Mirror was installed in a pool house in Newport Beach. The individual pieces of mirror had each edge polished. A real delicate task on the sharper points! The Verticals of the surround encasement are ribbed and lend a sophisticated touch to the white lacquer, mirrored Murphy bed system. A luxurious 14″ thick mattress is supported by our SICO Eurobed‘s standard flexible wood slat foundation. 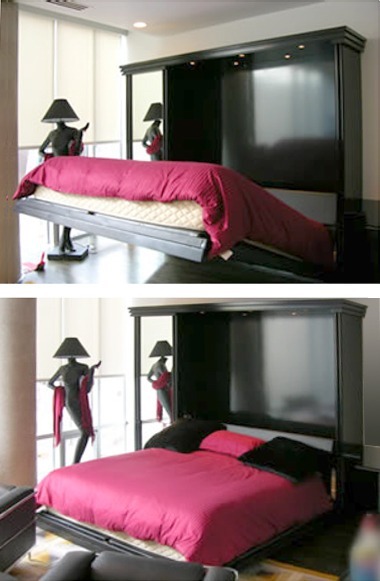 A comfortable Murphy bed! The interior fabric was selected by the designer. She asked us to accent the pattern with tufting on the back panel and sloped headboard. A complex pattern made even more mesmerizing. 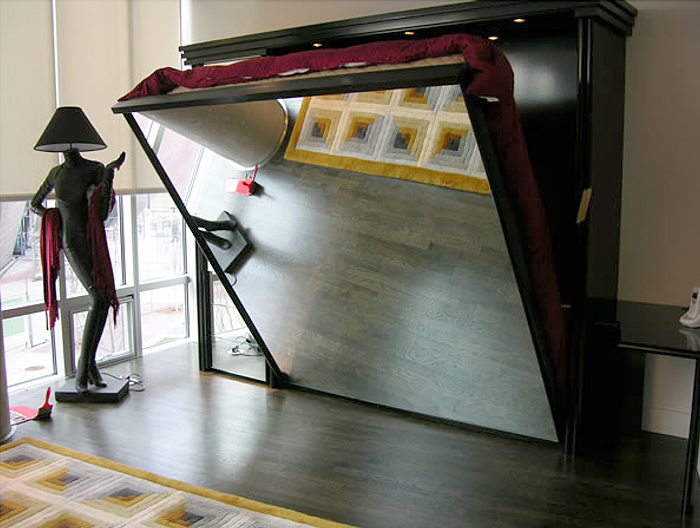 With all the design customization put into this unique mirrored murphy bed, give us a couple of extra weeks to manufacture to our standards for the World’s Best Murphy Beds, made in Denver, Colorado. There was not enough width on this wall for our signature Hidden Interior Nightstands, so our exclusive Dropped Deck acts as a nightstand instead, while hiding the huge Room Maker power packs beneath. 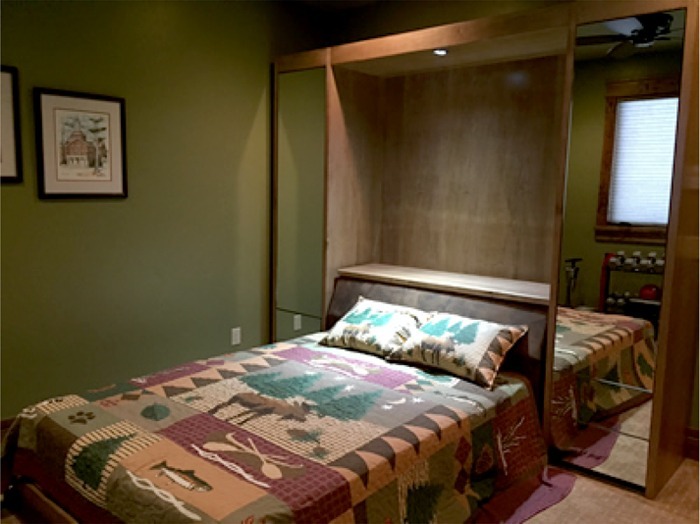 This Murphy bed with mirror was installed in a resort home near Steamboat Springs. 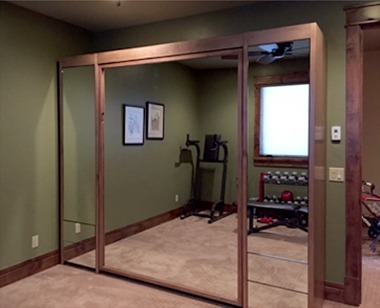 The main purpose of the room was to be an Exercise Room. But, as most resort homes experience, you have lots of visitors during the Ski Season and frequently need an extra bed! Handle-less, push-open doors and drawers make this mirrored murphy bed system even more sleek and modern.